Author Armand Cannamela had a wish to put into words the many experiences and encounters he had over his years. In his debut book, “Poems from the Heart” (published by iUniverse), Cannamela describes his interpretation of experiences, people and events through poetry. Exploring feelings of despair, joy, insignificance, grief and love, Cannamela provides a raw and revealing look into the full experience of life including a farewell poem to his late wife. The collection of poetry encourages contemplation and evaluation of the author’s life. It is Cannamela’s wish that his readers will relate to his words and develop their own feelings and impressions of the experiences. The book is available for purchase at: https://www.amazon.com/Poems-Heart-Armand-Cannamela/dp/1532062613. Armand Cannamela worked as an English teacher, chairman of the English department, middle school vice principal and elementary school principal for a total of 43 years. He served as councilman for the city of Perth Amboy, New Jersey, for 12 years and served as council president for six years. He spearheaded efforts for the industrial rebirth of the city combined with a new housing plan to meet the needs of townspeople with all income levels. Cannamela has devoted most of his effort in life to the education of children and to do his part to serve the community. 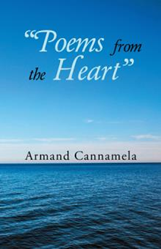 “Poems from the Heart” is Cannamela’s first book.